The village of Piornedo, located at 1300 meters above sea level, is one of the most enclaves enchanting in Galicia. Its originality lies in its historical-artistic set, made up of the fusion between typical houses and pallozas of Celtic origin. In addition, the village is located in an area of ​​great scenic interest, and is that some of its flora and fauna are unique in the world. 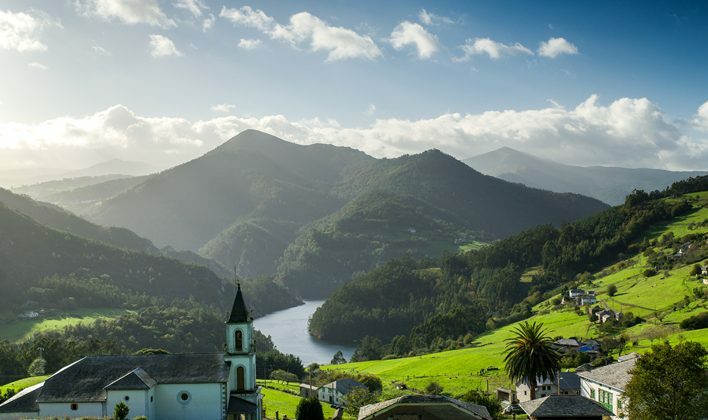 Its main assets are the multiple hiking trails that leave the area and its conservation almost intact, something that has been possible due to its distance from the main roads of Lugo. One of the pallozas, which until recently was the typical dwelling of the area, has been converted into an Ethnographic Museum, in which the visitor can discover more details about the way of life of its inhabitants. The orography of this Asturian town is marked by the Navia River. In its surroundings, highlights the landscape confluence between the Sierra de La Bobia and Penouta. The natural wealth of Boal is complemented by its cultural wealth, present in the Navia Historical Park. In it, it is possible to discover vestiges of the castreña culture and other times in which the relationship between the human being and the landscape was present in all day-to-day activities. One of these activities is still present today and has become one of the hallmarks of Boal: beekeeping. There is the Casa de la Apicultura, an exhibition space dedicated to the dissemination of this practice, and there is held annually, at the end of October, the Honey Fair, which this year has reached its thirty-first edition. Another attraction of this town are its good conditions for the practice of river sports or hiking. Those who prefer to enjoy architecture, have the opportunity to take a tour of their Indian buildings, full of stories about the Spanish emigration to America at the beginning of the twentieth century. This small Cantabrian town is located at the foot of the Picos de Europa, in the center of the region of Liébana, where the Quiviesa and Deva rivers run. Potes offers a wide variety of cultural and leisure possibilities. Some of its most important patrimonial exponents are the Monastery of Santo Toribio de Liébana, the Gothic Church of San Vicente de Potes, or the tower of the Orejón de la Lama, from the 15th century. Those who decide to enjoy the landscape of Potes in all its splendor, have options such as the cable car of Fuente Dé, the routes through the National Park of the Picos de Europa, or the visit to the tower of the Infantado. This parish, belonging to the council of Cabrales, has the distinction of being the highest town in the environment of the Picos de Europa, with 1050 meters above sea level. Its characteristic stone constructions and its natural caves are two of its most recognizable features. The latter are sometimes used for the maturation of the famous Cabrales cheese, which has several producers in this town, some of which have won awards for its quality. The steep orography of Sotres makes it a pilgrimage point for travelers looking for adventure and a rural environment whose economy continues to highlight the activities of the first sector, especially livestock. It was the birthplace of the religious Saint Ignatius of Loyola, founder of the Society of Jesus. In addition to the sanctuary, the municipality has two: the Basque Railway Museum and the Ingurugiro Etxea Museum. The first of them, of great relevance throughout Europe, exposes more than sixty restored vehicles that, together with other informative resources, shed the railway history of Euskadi. The second is focused on raising awareness about the care of the environment. Among its exhibition themes are sustainable urbanism, waste and consumption or climate change.